It seems the smartwatch's time is still coming. After the Pebble smartwatch crashed onto the scene with a record-setting Kickstarter in 2012, tech giants (most notably Samsung) and startups alike began falling over themselves to produce their own entries in the wearable-tech marketplace. The backlash was swift, with detractors arguing the gadgets were too buggy, too expensive, and not accessible enough to attract your everyday, non-gearhead shopper. A lot of that argument may be handily foiled by Glance, a project by Toronto-based startup Kiwi Wearables, that simply and inexpensively converts any existing wristwatch into a smartwatch. Glance is a slim, curved machine-aluminum unit that slips under your watchband, leaving a sliver of display screen visible. It connects to your device via Bluetooth, and uses a motion sensing and a top button to take commands. As it turns out, there's a lot you can do with that tiny amount of screen space, including reading texts (and auto-replying to them with a flick of the wrist), receiving phone call alerts, calling your phone (in case you can't find it), and using it as a mouse button or controller for a smart TV. 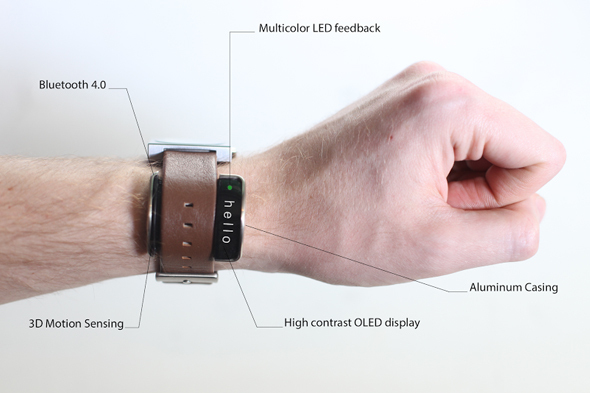 There's also a built-in activity tracker. The device is currently being funded via Kickstarter; early birds can preorder their own Glance for a $70 donation. An accompanying Glance app has been created for Android and iOS phones - Blackberry and Windows Phone support are available as stretch goals. Would you buy a Glance? Let us know in the comments below.